I got My Country Is Hockey really late in the 2011 calendar year, which is unfortunate because it is a fantastic book. Had I received it earlier it definitely would have garnered serious consideration for 2011 Hockey Book of the Year. I earlier lamented how fellow 2011 hockey book "How Hockey Explains Canada" really explained nothing at all. If you are looking for explanations, buy this book instead. How Canada’s values and fighting spirit have been shaped by the toughness and teamwork on the rink. 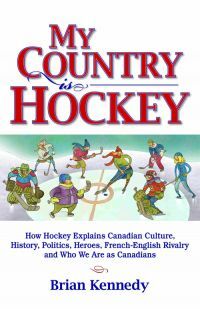 My Country is Hockey is an interesting self examination of Canada and Canadians, examining the game's history and myths that have interacted to create an interesting self image. An intellectual but by no means a heavy academic read, this is the kind of book that I personally need more time with. I need more time to process what this book is saying so that I can decide what I agree or disagree with. But that is the best part about this book. It asks questions, offers hypothesises and, best of all, makes you think about your game, your country and yourself. Brian Kennedy’s My Country Is Hockey Is A Revealing, Insightful, Must-Read Book.